By September 16, 1862, the 21st Massachusetts Infantry were certainly battle-hardened veterans. They had, for the past six months, seen tough fighting. The unit had left Massachusetts approximately 1,000 strong. Now, encamped near Sharpsburg, Maryland with the rest of the Army of the Potomac, the diminished regiment numbered just over 150. The 21st was commanded by Colonel William Smith Clark, about whom I’ve written a number of times before. He was a professor of chemistry from Amherst College. An abolitionist who was passionate about preserving the Union. A man who, after resigning his commission in 1863, would become the primary founder of UMass Amherst. On the evening of September 16, 1862, the 21st Massachusetts, part of the Ninth Corps commanded by General Ambrose Burnside, was encamped on hills to east of Rohrbach’s bridge over Antietam Creek. Across the creek to the west was the town of Sharpsburg, occupied by the Confederate army. It was quite clear to Clark, and just about everyone else in the Ninth Corps, that they would be assaulting that bridge in the morning. Colonel Clark finished out the night before battle signing paperwork prepared by his adjutant. That night it rained heavily. By dawn, the Battle of Antietam had already begun on the far right flank of the Union army, about two miles away from where Clark and his regiment were encamped. There was, at this point, little activity on Clark’s portion of the battlefield. Just some artillery fire back and forth that had little effect. As the battle raged far off in the infamous Cornfield, the men of the 21st Massachusetts were lucky enough to receive a mail call and sat down to read letters from home. Clark received something rather better than a letter from home. That morning, Captain Newton Spaulding Manross of the 16th Connecticut Infantry strolled into Colonel Clark’s camp. Manross and Clark were old chums. Best friends. They had both attended preparatory school at Williston Seminary in Easthampton, Massachusetts. After that, Clark went off to Amherst College and Manross to Yale College, but they remained close. Both studied chemistry. After receiving their undergraduate degrees, Clark and Manross traveled together to Gottingen, Germany where they earned their PhD’s in Chemistry at Georgia Augusta University in 1852. When Clark went off to war in 1861, he requested that Professor Manross take over his professorship at Amherst College, which Manross gladly did. Until he could no longer resist the call to arms. 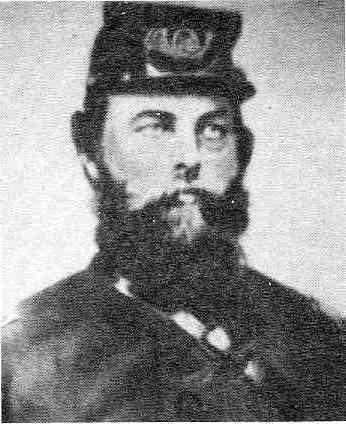 In August 1862, Manross accepted a commission with the 16th Connecticut Infantry. In making the decision, he told his wife, “You can better afford to have a country without a husband than a husband without a country.” The 16th Connecticut was rushed to service in the Army of Potomac only two weeks after they signed up. The regimental historian wrote that they had “no drill, no discipline, few instructions even in marching. It was little more than a crowd of earnest Connecticut boys.” Marching hard through Maryland, they had only caught up with the Army of the Potomac a few days prior to the Battle of Antietam. The day before the battle, they loaded their muskets for the first time. And now they were about to be fed into the bloodiest day in American history. In short, Captain Manross and the 16th Connecticut were as green as green could be. But perhaps Manross was able to set aside those concerns just briefly on the morning of September 17, 1862 as he walked into Clark’s camp. How surprised Clark must have been to see him, his old friend, now in the army. The same Corps, even. They breakfasted together as the sound of musket fire echoed from the northwest. We can only guess what they talked about, two best friends about to go to battle. Doubtless, they spoke of old times as students of science, hunting for rare mineralogical specimens. As young men, both had been credited in academic journals for important finds. Clark had sent specimens to the Smithsonian. They probably spoke of the sad condition of the 21st Massachusetts and the greenness of the 16th Connecticut. And then they parted, Manross going back to his regiment. And before long, the Ninth Corps was pressed into action. Clark’s 21st Massachusetts was part of Ferrero’s brigade. Burnside launched several brigades (some historians would argue recklessly) against Rohrbach’s bridge. A small group of 400 Georgians managed to hold that bridge against most of the Union Ninth Corps–thousands of men. After the bloody debacle, the bridge would be known as Burnside’s Bridge. Ferrero’s brigade, including the 21st Massachusetts, was the one that finally carried the bridge. After a furious charge, Clark had the 21st Massachusetts lay down covering fire while the 51st New York and 51st Pennsylvania simultaneously stormed the bridge. Meanwhile, the 16th Connecticut was part of a far-flung flanking maneuver. It was a clever idea on Burnside’s part…in concept. But not in execution. 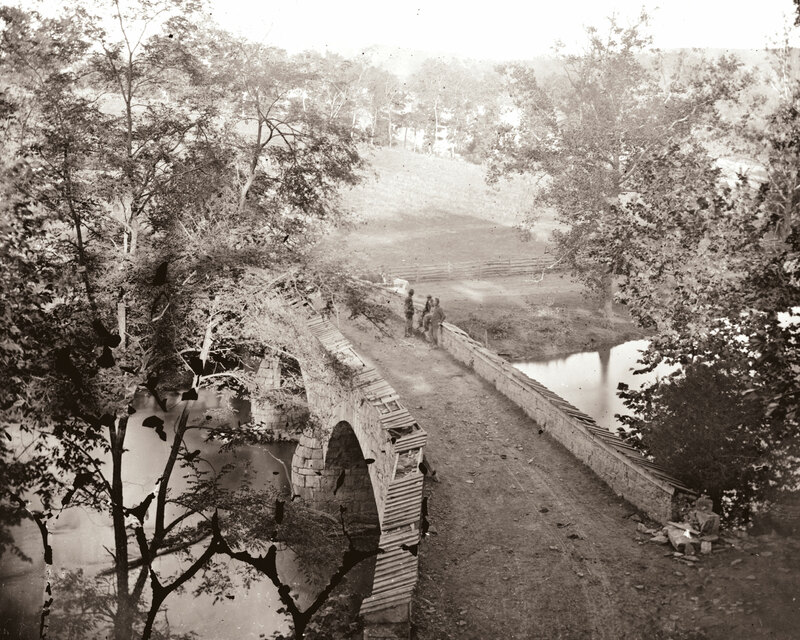 Rodman’s division, including the 16th Connecticut, was to cross Antietam Creek well south of the action and surprise the Rebels by appearing on their flank. Unfortunately, their guide turned out to be a secessionist, and he led the division on a roundabout march. When Rodman’s division finally crossed Antietam Creek (quite late…therefore the terrible casualties at Burnside’s Bridge), they did indeed take the Rebels by surprise and pushed them pell-mell back to the town of Sharpsburg. For the green 16th Connecticut, it must have been quite a thrill, double-quicking up and down those ridges, watching the Rebels flee before them. But then disaster struck. Confederate General A.P. Hill arrived from the south with a fresh division of troops and nailed the advancing federals on the flank. And the unit on the flank happened to be the untried 16th Connecticut. As huge numbers of Confederate troops suddenly appeared on the left flank of his regiment, Colonel Francis Beach of the 16th frantically commanded, “Change front forward on the tenth company! Change front forward on the tenth company!” The untrained officers in his regiment had no idea what that meant. The 16th Connecticut was cut to pieces. Captain Newton Manross, in his first battle, was struck by grapeshot and killed. I tend to read between the lines here. Clark did not write about the death of his best friend, at least not in any surviving documents. But I believe that the trauma of that awful battle, and especially the loss of Manross, were responsible for Clark’s being sent home to recover. It was the first time in the course of the war that Clark suffered from such debility…a major turning point in his career as a soldier.